We’ve written a lot about 3D printers here at GeekTech, but we’ve never written about a 3D printer as interesting and as tasty as the Burritob0t by Marko Manriquez. 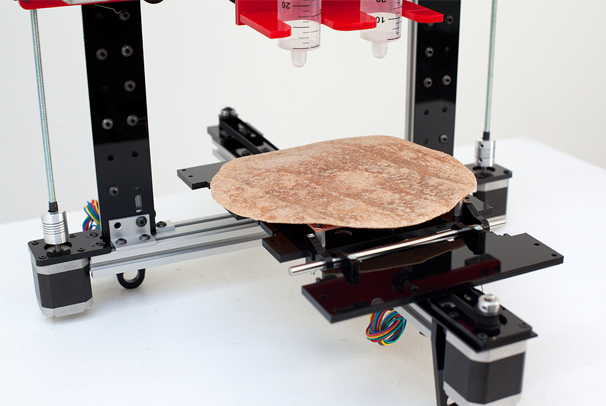 It’s a 3D printer, but with a twist: Instead of extruding ABS or other printing materials, the bot extrudes cheese, beans, and other delicious burrito fillings onto a tortilla. It uses a simple system of compressed air and syringes designed for food. 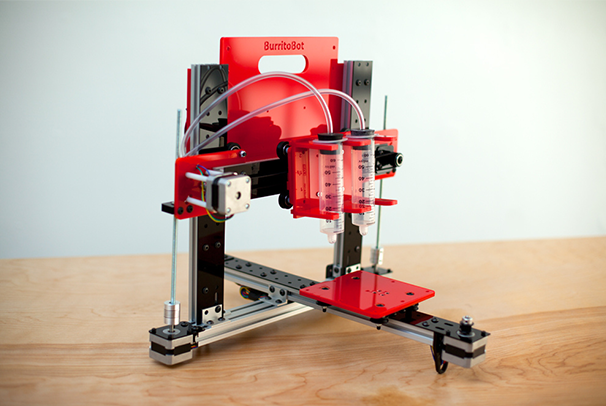 The Burritob0t is Marko’s thesis project at NYU, and he built it with the help of other open-source hardware designs available, including the RepRap project that we’ve seen before. Marko hopes the Burritob0t will help him explore the origins of our food and what it means to different people. I’m more interested in whether the final bot will be able to fold my burrito for me. At the time of this writing, the Burritob0t isn’t quite finished yet. However, on the Buttirob0ts website, Marko does state that he plans to demo the printer by printing and assembling an edible burrito this summer in New York. He also plans to get a Kickstarter project going, hopefully so I can build one a Burritob0t in my kitchen and never have to worry about burrito withdrawal again.